Offenders carrying out Community Payback along an idyllic stretch of disused railway have been praised by Cheshire West and Chester Council for improving the popular path. Community Payback is a sentence made by the court that involves people working for a period of time under the supervision of probation on tasks that benefit local areas. Teams of up to eight people doing unpaid work have shifted tonnes of mud, leaves and silt that had obscured swathes of the route on the Wirral Way, near Lees Lane, Little Neston. The work started last October, and has been supervised by the Cheshire & Greater Manchester Community Rehabilitation Company’s Community Payback Supervisor, Val Barker. Jack, who was sentenced to 70 hours unpaid work, said: “It’s nice that what we are doing is appreciated. The disused railway is an 11-mile stretch that links Hooton to West Kirby. 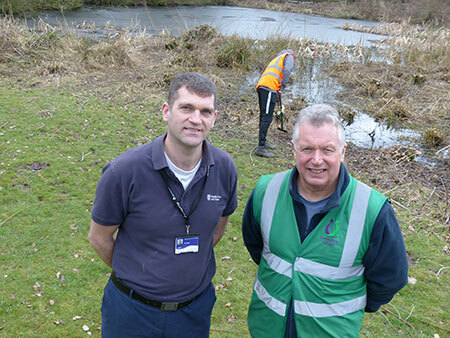 Val said: “We’ve a really good relationship with the Council and have been happy to get stuck into this task. It’s a beautiful stretch, but sadly – as well as the silt – a fair amount of litter had been dropped as well, but we’ve shifted that too. “People on Community Payback have worked hard and many passers-by have thanked them for their efforts. Offenders across this region carry out more than half a million hours of unpaid work every year.